On July 21, 2009, U.S. Secretary of the Interior Ken Salazar proposed a two-year withdrawal of about 1 million acres of Federal land near the Grand Canyon from future mineral entry. These lands are contained in three parcels: two parcels on U.S. Bureau of Land Management land to the north of the Grand Canyon (North and East Segregation Areas) and one on the Kaibab National Forest south of the Grand Canyon (South Segregation Area). The purpose of the two-year withdrawal is to examine the potential effects of restricting these areas from new mine development for the next 20 years. This proposed withdrawal initiated a period of study during which the effects of the withdrawal must be evaluated. At the direction of the Secretary, the U.S. Geological Survey began a series of short-term studies designed to develop additional information about the possible effects of uranium mining on the natural resources of the region. Dissolved uranium and other major, minor, and trace elements occur naturally in groundwater as the result of precipitation infiltrating from the surface to water-bearing zones and, presumably, to underlying regional aquifers. Discharges from these aquifers occur as seeps and springs throughout the region and provide valuable habitat and water sources for plants and animals. Uranium mining within the watershed may increase the amount of radioactive materials and heavy metals in the surface water and groundwater flowing into Grand Canyon National Park and the Colorado River, and deep mining activities may increase mobilization of uranium through the rock strata into the aquifers. In addition, waste rock and ore from mined areas may be transported away from the mines by wind and runoff. The larger PDF for SIR 2010-5025 combines all chapters. To immediately access smaller PDFs of the individual chapters, use the links listed at the bottom of this webpage. 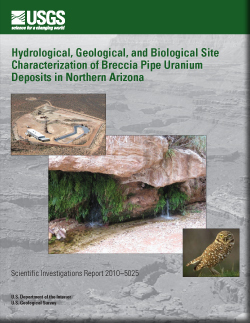 Alpine, Andrea E., ed., 2010, Hydrological, geological, and biological site characterization of breccia pipe uranium deposits in northern Arizona: U.S. Geological Survey Scientific Investigations Report 2010–5025, 353 p., 1 pl., scale 1:375,000.